Supernatural 9x21 "King of the Damned"
Leading the troops, our man Cas. Well, this turned out to be a bigger episode than I was expecting for the second to last episode of the season. I guess it's not really that unexpected though, because they had to wrap up at least one of the storylines soon, though I confess I was hoping the two would converge in some way rather than being completely separate as they have been. Alas, I did not get my wish. I don't think the boys even mentioned they were going after Abaddon to Castiel at all. Or, at least, not on screen. Anywho, let's start things off with Crowley and his merry band of demons. Or, not so much his merry band of demons anymore, actually. His demon buddies have sold him out to Abaddon. She wants him to tell her where the first blade is hidden so she can destroy it before it destroys them, they work together before getting back to working against each other, etc. She brings in Crowley's long lost son Gavin from 18th century Scotland to sweeten the deal. Or rather, sour the deal, as she wants to appeal to Crowley's new human side. That is, not wanting to see his son get tortured to death. 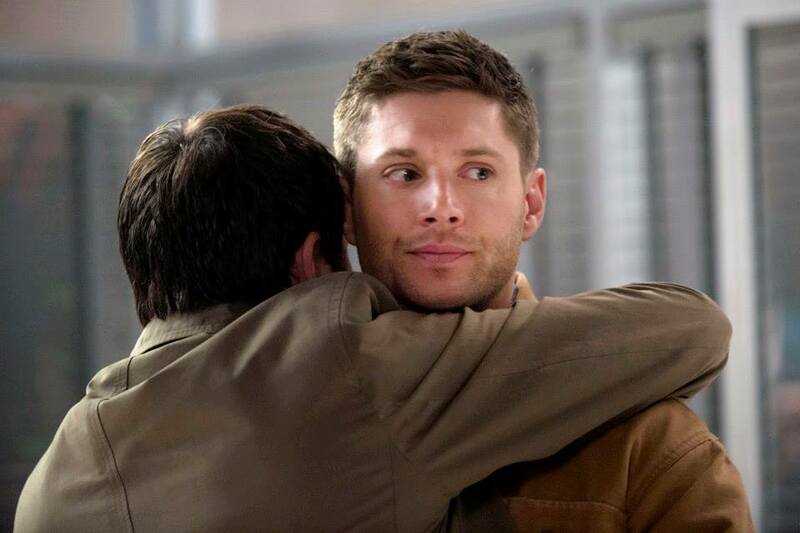 Meanwhile, the brothers Winchester are invited to Castiel's new angel bunker where they are trying to figure out a way to defeat Metatron and get back in to heaven. 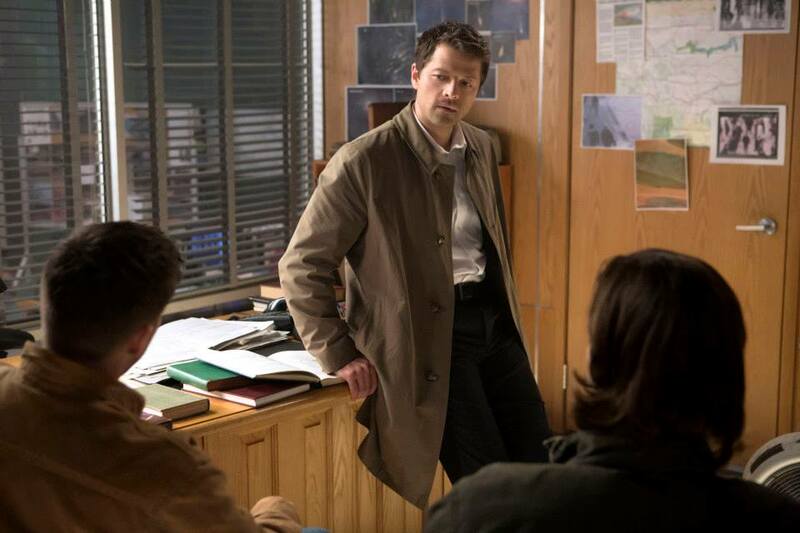 They've managed to capture an angel who was bragging about his connections to Abaddon, but because Cas does not want angel on angel violence anymore, he's brought in the Winchesters to do his dirty work. Dean is all ready to lay the smack down on the angel, but Sam has a more thoughtful approach, basically goading the guy into giving up information of his own accord. Basically, there is another way in to heaven, through some portal that is constantly moving. Metatron is also recruiting some sort of secret squad, purposes unknown. After they talk to the guy, though, he turns up dead. Which means there is an angel traitor in their midst. Castiel also questions Sam a bit on what it was like with Gadreel in his head back in the day, to see if he was really evil or not, basically. Not so much with the hugs. Back in Crowley country, father and son have a bit of a reunion wherein Gavin actually thinks it's kind of cool to be the son of the King of Hell. But, he wants to use this information, namely that he can never go to Hell himself no matter what he does, and use it when he goes back to his time. Crowley is less than enthused to send him back to his time because, you know, he ends up going on a ship to the Americas that sinks. But, I digress. Crowley calls up the boys to tell them that he knows where Abaddon is and tells them where to find the blade. All while Abaddon listens in. Hmm. Has he reconsidered her offer to work together to defeat the Winchesters? Oh me oh my! Castiel meets up with Gadreel on the sly to try to get a sense of his true desires. Basically, Gadreel just wants to be doing the right thing. To rebuild Heaven and whatnot, to make up for his past wrongs. Castiel tries to make him see that Metatron is not the one to be following in that endeavor, as that is not his ultimate goal. They get jumped by some of Metatron's baddies, which Cas says only proves his point. He wants Gadreel to act as spy within Metatron's camp. Will Gadreel do it? Dun dun dun. Sam and Dean go into mission mode. They find the first blade after some shenanigans with a hell hound, then call up Crowley to get the location of where Abaddon is. He gives Dean the code word of Poughkeepsie so they know that something is up. Dean, however, does not see fit to also tell Sam of this warning, but instead tells him to go off and search the basement while he goes up and deals with Abaddon. At first, things do not look like they are going to go too tell for our Dean, but of course he's got this whole Mark of Cain thing going on, so when she magic hands him against the wall, he just goes crazy mark blade badass and, you know, kills her dead. Yes. That's right. Dean just killed Abaddon. Right in time for Sam to come in and see him keep on stabbing after she's already gone, all crazy style. Sam wants Dean to hide that blade until they can go after Crowley again (because, you know, he manages to escape with his son and let him loose in the 21st century despite the boys telling him he needed to be sent back), but Dean just straight up says, "no." Yowza. - This whole ending to the Abaddon storyline felt a bit underbaked to me. As in, we hardly had much of it throughout the season, really. Or maybe the seasons are all blending together to me and there was more than I remember. But honestly I don't think so. And I really did hope it would somehow meet up with the angel story in an organic way, as I previously mentioned. As it is, it felt like a kind of anticlimactic death scene for Abaddon, who, granted, hasn't been on the show as long as Crowley or anything, but has been around for at least a couple seasons now. Another lady bites the dust. - What exactly is Metatron's ultimate goal anyway? He keeps saying he wants to remake Heaven or something, but into what? - Will we be seeing more of Gavin in the future, now that he's just roaming around the 21st century all willy nilly? At least he can read now. That would be awkward. - Will this angel story really be resolved at the end of the season? Because right now it feels very much like there would still be a lot of story to tell, but there are only two episodes left. - Sam mentioned in a patented end of episode Impala chat that he thinks Dean is being changed by the Mark. I think we can all see this happening as well. What does that mean moving forward? Do you think he'll still have the Mark by the end of the season, or will it be magically removed in some way as well? Crowley: So all those with me say yo. Abaddon: Yo. I mean I'm literally with you, not with you, with you. Dean: Well, you just asked me to dance. Crowley: And there you were, worried the old man wouldn't amount to much. I'm glad that at least one of the story lines is put to rest (Sorry Abbadon). Crowley, being Crowley will be back with full evil force soon, I'm sure although I'm not totally sure what that makes his relationship with the boys. There is still the Mark of Cain, and the angel wars (including Gadreel) so there are lots of the things to finish. Now that there is a Season 10, maybe some of these things will continue. I'm curious as to what Crowley will be doing to re-establish his role as king. All in all I found this to be one of the best episodes (at least of the last 3 or 4 anyway. It's possible they could continue a storyline on to season 10, but it doesn't particularly seem like their style. Usually they wrap up the main storyline and preview the one coming for the next season around finale time. But who knows!